CHICAGO — Here’s what we know about new Chicago Blackhawks coach Jeremy Colliton: he’s 33 years old and was selected in the 2003 NHL draft, the same class as Chicago defenseman Brent Seabrook. Actually, the two know each other quite well: Colliton played in a summer league with Seabrook when they were 11. “We sort of followed the same career path,” Seabrook said. They played in the Western Hockey League against each other, and were teammates for Team Canada on two World Juniors teams. Afterwards is where their careers diverged. Following back-to-back four-point games, the Cleveland Monster takes the honor. While Seabrook was taken No. 14 overall by the Blackhawks and has now skated in 1,019 NHL games and counting, Colliton was drafted in the second round by the New York Islanders, but played in only 57 NHL games over five seasons. He struggled to latch onto a team after the 2012-13 lockout and signed with Mora IK in Sweden. Colliton played only three games before retiring, still feeling effects of post-concussion syndrome. He transitioned into coaching, staying in Sweden. The Blackhawks became enamored by Colliton and hired him to coach their AHL team before last season. Here’s what else we know about Colliton: he and his wife just welcomed a new daughter on Thursday, five days before his NHL appointment. (The couple also has two sons). We know that Colliton was known in Rockford as being a great communicator. We know GM Stan Bowman and team president John McDonough think highly of him. But in a nearly 40-minute introductory press conference, in which Colliton sat beside his bosses and team owner Rocky Wirtz, we didn’t learn much about the man tasked with succeeding Joel Quenneville, the NHL’s second-winningest coach of all time. Colliton only briefly referenced his notes, a torn out piece of paper from a spiral notebook. He was soft-spoken, if not deferential. The youngest coach in the NHL will be a mystery to many and his impact on the team remains to be seen. In the meantime, here’s everything we know now about the state of the Blackhawks, including the important questions that need to be explored. Parting with Quenneville was never going to be easy, but the veterans who won three Stanley Cups with the coach took the firing especially hard. The Blackhawks got off to a quick start, but earned only one of their last possible 10 points, including a winless Western Canada road swing immediately before the firing. Blackhawks management disputed that the dreadful Western Canada swing was the sole reason for the firing, but it was certainly the impetus. Management saw a situation where the season could spiral, as Wirtz said. There have been rumblings of a power struggle between the coaching staff and management for years, and Bowman especially wanted to quash any rumors. McDonough said the team didn’t consider firing Quenneville last season, considering Crawford was out and the loss of Marian Hossa was significant. The team’s performance — missing the playoffs for the first time in a decade — wasn’t an indictment on Quenneville considering the hand he was dealt. Wirtz, however, seemed to hint that the group considered a change last season. McDonough said he did not consider firing both Quenneville and Bowman, reiterating his faith in Bowman’s roster construction. It should be noted that McDonagh has a bigger say in hockey operations matters than most team presidents. So why exactly did the team have so much faith in Colliton? The team was clearly invested in his development, but the promotion felt rushed; Colliton was only in his second season in the AHL. Despite success — the team made it to the Western Conference Finals this past season — it’s not like he was a coveted asset the Blackhawks needed to secure with risk of another team snatching him up. Blackhawks management repeatedly called Collision a good communicator, and got a bit defensive, clarifying they weren’t saying there was a communication breakdown with Quenneville. Gustafsson has since become an NHL regular, playing in 15 games this season averaging 21 minutes per game. Bowman cited veterans Lance Bouma and Cody Franson buying into Colliton’s system — despite being disappointed they weren’t on the NHL — as a reason he thinks Colliton can lead a team with eight players that are 30-years-old or older. Colliton’s first practice was definitely up-tempo. He seemed to use a lot of the same line combinations we’ve seen recently, but again, it was day one. Will he implement new systems? Based off his comments, don’t expect anything drastic, at least not right away. The Blackhawks also fired two assistant coaches — Kevin Dineen and Ulf Samuelsson — and only added one: 66-year-old Barry Smith, who had been on the Blackhawks hockey operations staff. (Smith has been an assistant coach on three teams, but was last behind an NHL bench in 2007). Bowman said he doesn’t have plans to hire another assistant. More moves on the way? The Colliton hiring certainly signals the Blackhawks are embracing their youth movement. 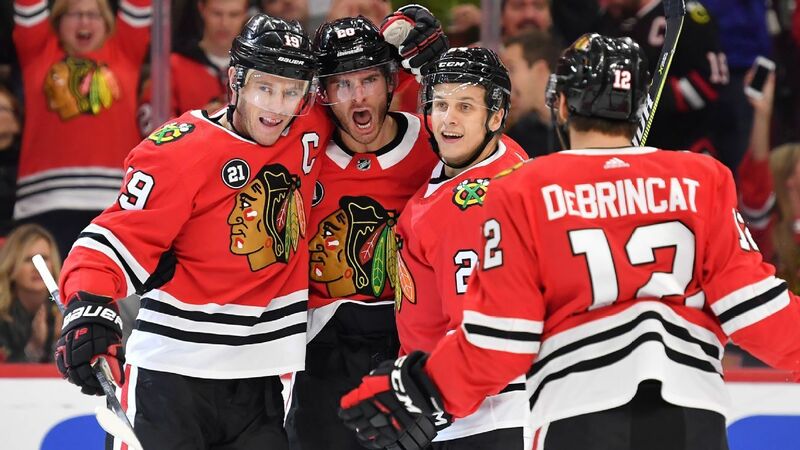 It’s only one month into the season and plenty of time to catch ground, but if the Blackhawks continue to flounder, it’s fair to wonder if a big shakeup is coming. For the record, management reiterated several times the goal is to still win this season, and they believe there’s still time to make up ground. When asked if he anticipates roster moves if the team stands as it is, Bowman vaguely said he’s always looking for ways to improve the roster. He wasn’t going to tip his hand here. But say the team still struggles, who could be moved? Kane is likely untouchable. At 30, he is still producing at a superstar level and shows no sign of regression. A trade of captain Jonathan Toews would be shocking, and might cause irrevocable harm in the locker room and among the fan base. That leaves defensemen Brent Seabrook and Duncan Keith. Seabrook is the name most-circulated among fans, though his cap hit (6.85 million) and term (through the 2023-24 season) make his contract almost too cumbersome to move. Any trade involving Seabrook would likely include other players. Keith ($5,538,462 million through 2022-23) is far more attractive to other teams, though the Blackhawks would demand a huge return. Brandon Saad has struggled in his second stint, but trading him would mean Bowman admitting mistake; and just like when this issue sprouted up last season, it would entail Chicago selling low. But after firing a coach who won three Stanley Cups for the franchise, it’s tough to say that anything would be truly shocking at this point.